Eagle Bay Park contains a partially sheltered anchorage with a gravel beach. Recreational opportunities include beach walking, crabbing and camping. The 2 mooring buoys that use to be at the south end of the bay were removed by BC Parks on October 1, 2009. Eagle Bay Park is located on the east side of Kitimat Arm (Douglas Channel), approximately 25 km south of Kitimat. Access is by boat only. Use Marine Chart #3743 (Douglas Channel) and NTS Map Sheet # 103 H/15 (Kitimat Arm). The nearest communities are Kitimat and Kitimaat Village. History: Eagle Bay Park was designated as a Park on May 20, 2004 following recommendations from the Kalum Land and Resource Management Plan. Cultural Heritage: Eagle Bay Park is within the traditional territory of the Haisla First Nation and contains culturally modified trees. There are remains of a Grumman Widgeon plane wreck on the beach and intertidal area at the south end of the bay. The Grumman Widgeon was a small, 5-6 person, twin engine, amphibious aircraft that was produced from 1941-1955. It is similar to the larger Grumman Goose. Wildlife: Eagle Bay Park supports species diversity due to its proximity to a nearby river estuary, the marine environment and the sheltered inlet. The site provides important over-wintering habitat for waterfowl. 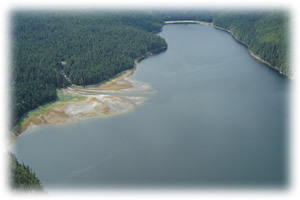 Two unnamed creeks draining into the south end of Eagle Bay are used by spawning Coho, Pink, and Chum salmon. There is a trapper’s cabin built by the Haisla First Nation and is available for public use. The cabin is 15’ x 12’ with 2 double bunk beds. The cabin is available on a first-come, first-served basis. Be prepared to sleep outside if the cabin is full. UTM coordinates are: Zone 9U 5961126 m North; 0519297 m East. The 2 mooring buoys that use to be at the south end of the bay were removed by BC Parks on October 1, 2009. Please Conserve Firewood. Campfires are permitted; however, firewood is not provided. We encourage visitors to conserve wood and protect the environment by minimizing the use of campfires and using camp stoves instead. Limited burning hours or campfire bans may be implemented. A backcountry toilet chest was installed in September 2011. It is located behind the Haisla First Nation trapper’s cabin. UTM coordinates for the toilet chest are: Zone 9U 5961115 m North; 0519340 m East.